Just a quick post. Very busy day learning computer things. Why is there always more to learn on the computer? More features, new features, features that have been changed from the ones that took two weeks to learn the first time. Where does all the obsolete knowledge go? How much can my brain hold? If you ask my son, he would say it is obvious I don’t have any room left. He may be right. First photo is of a knit stitch I find very intriguing. 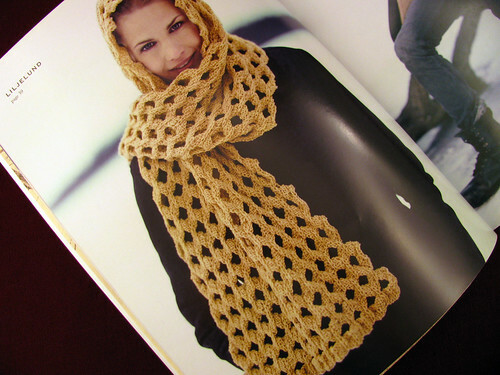 The pattern is in a 2004 book called “Transitions” by Cornelia Tuttle Hamilton. It also says book number three, so there must be other pattern books. I like several of the designs in the book. I picked the book up at the closing sale of Simply Knitting. 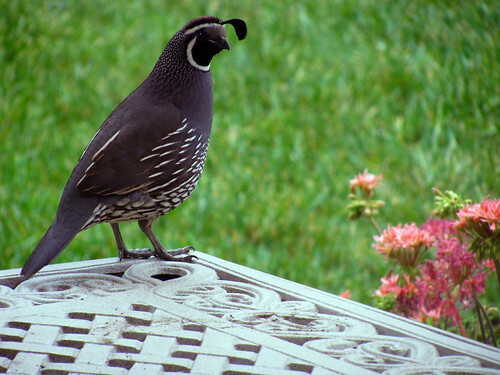 Finally I was able to get a photo of a California quail. I took it though the glass of the sliding door. Not the best photo, and the table still has repotting dirt on it. I just love the top knots on their little heads. This entry was posted on Saturday, April 25th, 2009 at 3:00 am and is filed under Garden and Knitting. Tagged: Garden, Knitting. You can feed this entry. You can leave a response, or trackback from your own site.